Piston Aircraft: These are generally the smallest and the slowest aircraft types that are used for shorter distances, but are also considered to be the most competitively priced planes available for charter. These planes are single engine or twin engine propeller planes and great for short flights within your state, or from one state to another bordering state. Example trips would be Miami to Nassau Bahamas, or Las Vegas to Denver, or New York to Martha’s Vineyard. Turbo Prop Aircraft: These are like the “Big Brother” of piston aircraft. They can be much faster, more reliable, and of course larger. Turbo Prop Aircraft are great for flights within regions of the country, or in places like Europe, between countries. For instance, if you want a flight from Los Angeles to San Francisco, or Florida to Alabama, Paris to London. These may or may not have a potty seat, or a lav bathroom depending on the plane. Turbo Props well know for their excellence are the King Air 200, Pilatus PC-12, and Piaggio Avanti. Light Jets: Light Jets will consist of the entry level jets, light jets, and super light jets. All different sizes within the range and capable of seating between 4-8 passengers. These are great for flights between many states. Great examples would be Teterboro NJ to Boca Raton FL, Washington D.C. to New Orleans, Houston Texas to Chicago Illinois. Most light jets have enclosed lav restrooms for your convenience. Most notable light jets will be the Cessna Citation CJ3, Hawker 400XP, and the Phenom 300. Midsize Jets: This category consists of Midsize Jets and Super Midsize Jets. Midsize Jets are know for their cross country possibilities. Not all of these can make it non stop and it will depend on passenger and baggage load, however most of them are considered stand up cabins which are more comfortable. Midsize Jets will also have fully enclosed bathrooms with a hard pocket door. Some notable Midsize and Super Midsize Jets are the Lear Jet 60, Challenger 300, Hawker 800XP, and Cessna Citation X. Heavy Jets: Heavy jets are for your larger family flights, and flights across the ocean to other countries. They have longer ranges and are full stand up cabin with enclosed bathrooms and galley kitchens. Most heavy jets have convertible couches that turn into beds for your night time flights, and you can expect a flight attendant on board to help with your catering accommodations. The Gulfstream IV-SP, Falcon 900, Bombardier Challenger 600 series are the most common. Long Range Jets: For long haul flights we can also arrange Ultra Long Range Jets such as the Gulfstream G550, Bombardier Global Express, or even a Boeing Business Jet BBJ. Naturally these are also the most expensive planes of to use when flying private but have the top luxury VIP settings. View all aircraft available for your flight. 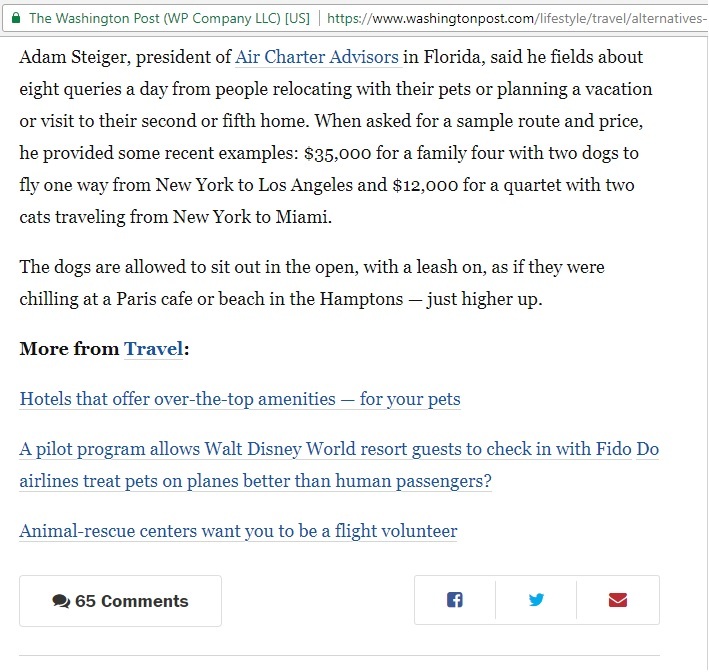 Check out our feature in the Washington Post!